^ Margaret Sands Orchowski (2015). The Law that Changed the Face of America: The Immigration and Nationality Act of 1965. Rowman & Littlefield. p. 32. ISBN 9781442251373. ^ a b c d e f Mark H. Moore (October 16, 1989). "Actually, Prohibition Was a Success". The New York Times. Retrieved May 29, 2017. ^ a b c MacCoun, Robert J.; Reuter, Peter (August 17, 2001). Drug War Heresies: Learning from Other Vices, Times, and Places. Cambridge University Press. p. 161. ISBN 9780521799973. ^ Jack S. Blocker, Jr (February 2006). "Did Prohibition Really Work? Alcohol Prohibition as a Public Health Innovation". American Journal of Public Health. 96 (2): 233–243. doi:10.2105/AJPH.2005.065409. PMC 1470475. PMID 16380559. ^ a b c d Pinard, Georges-Franck; Pagani, Linda (November 13, 2000). Clinical Assessment of Dangerousness: Empirical Contributions. Cambridge University Press. p. 199. ISBN 9781139433259. These declines in criminality extended from 1849 to 1951, however, so that it is doubtful that they should be attributed to Prohibition. Crime rates in New York City, too, decreased during the Prohibition period (Willback, 1938). ^ Hall, Wayne (2010). "What are the policy lessons of National Alcohol Prohibition in the United States, 1920–1933?". Addiction. 105 (7): 1164–1173. doi:10.1111/j.1360-0443.2010.02926.x. PMID 20331549. ^ Foster, Gaines M. (2002). Moral Reconstruction: Christian Lobbyists and the Federal Legislation of Morality, 1865–1920. University of North Carolina Press. pp. 233–34. ISBN 978-0-8078-5366-5. ^ Boyd Vincent, "Why the Episcopal Church Does Not Identify Herself Openly With Prohibition", The Church Messenger, December 1915, reprinted in The Mixer and Server, Volume 25, No. 2, pp. 25-27 (February 15, 1916). ^ E.g., Donald T. Critchlow and Philip R. VanderMeer, The Oxford Encyclopedia of American Political and Legal History, Oxford University Press, 2012; Volume 1, pp. 47-51, 154. ^ William D. Miller (2017). Pretty Bubbles in the Air: America in 1919. University of Illinois Press. p. 151. ISBN 978-0-252-01823-7. ^ F. Scott Fitzgerald (1920). This Side of Paradise. Charles Scribner's Sons. p. 223. ("The advent of prohibition with the 'thirsty-first' put a sudden stop to[...]" [referring to July 1919]); and F. Scott Fitzgerald (2008). The Beautiful and the Damned. Cambridge University Press. p. 407, note 321.2. ISBN 9780521883665. ("[W]hen prohibition came in July [...]"). 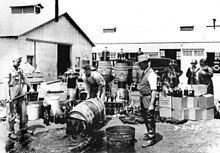 ^ "History of Alcohol Prohibition". National Commission on Marijuana and Drug Abuse. Retrieved November 7, 2013. ^ Dwight Vick (2010). Drugs and Alcohol in the 21st Century: Theory, Behavior, and Policy. Jones & Bartlett Learning. p. 128. ISBN 978-0-7637-7488-2. Retrieved January 18, 2011. ^ a b Bob Skilnik (2006). Beer: A History of Brewing in Chicago. Baracade Books. ISBN 978-1-56980-312-7. ^ a b c d Blocker, Jack S. (2006). "Did Prohibition Really Work? Alcohol Prohibition as a Public Health Innovation". American Journal of Public Health. 96 (2): 233–243. doi:10.2105/AJPH.2005.065409. ISSN 0090-0036. PMC 1470475. PMID 16380559. ^ a b Lyons, Mickey (April 30, 2018). "Dry Times: Looking Back 100 Years After Prohibition". Hour Detroit. ^ a b David Von Drehle (May 24, 2010). "The Demon Drink". Time. New York, New York. p. 56. ^ a b c d e Rose, Kenneth D. (1997). American Women and the Repeal of Prohibition. NYU Press. p. 45. ISBN 9780814774663. 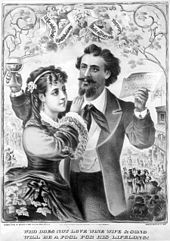 ^ "Teaching With Documents: The Volstead Act and Related Prohibition Documents". United States National Archives. February 14, 2008. Retrieved March 24, 2009. ^ David E. Kyvig (2000). Repealing National Prohibition. ^ "TTBGov General Alcohol FAQs". United States Alcohol and Tobacco Tax and Trade Bureau. April 2006. Retrieved November 7, 2010. ^ Anthony Dias Blue (2004). The Complete Book of Spirits: A Guide to Their History, Production, and Enjoyment. HarperCollins. p. 73. ISBN 978-0-06-054218-4. ^ a b Paul Aaron and David Musto (1981). "Temperance and Prohibition in America: An Historical Overview". In Moore, Mark H.; Gerstein, Dean R. (eds.). Alcohol and Public Policy: Beyond the Shadow of Prohibition. Washington, DC: National Academy Press. pp. 127–181. ISBN 978-0-309-03149-3. ^ Jack S. Blocker (1989). American Temperance Movements: Cycles of Reform. Boston: Twayne Publishers. p. 10. ^ a b Blocker, American Temperance Movements: Cycles of Reform, p. 16. ^ Blocker, American Temperance Movements: Cycles of Reform, p. 14. ^ William Harrison De Puy (1921). The Methodist Year-book: 1921. p. 254. ^ Henry, Clubb (1856). The Maine Liquor Law. Maine: Maine Law Statistical Society. ^ Ruth Bordin (1981). Women and Temperance: The Quest for Power and Liberty, 1873-1900. Philadelphia: Temple University Press. p. 8. ^ Frances E. Willard (2007). Let Something Good Be Said: Speeches and Writings of Frances E. Willard. Chicago: University of Illinois Press. p. 78. ^ Blocker, American Temperance Movement: Cycles of Reform, p. 13. ^ "Prohibition". Kansas Historical Society. November 2001. ^ Glass, Andrew (December 27, 2017). "Carrie Nation smashes a Kansas bar, Dec. 27, 1900". Politico. Retrieved January 2, 2019. ^ "Carry A. Nation: The Famous and Original Bar Room Smasher". Kansas Historical Society. November 1, 2002. Retrieved December 21, 2008. ^ a b Richard J. Hopkins (September 1925). "The Prohibition and Crime". The North American Review. 222 (828): 40–44. ^ Marni Davis (2012). Jews And Booze: Becoming American In The Age Of Prohibition. New York University Press. pp. 86–87. ISBN 978-0-8147-2028-8. ^ Cherrington, Ernest (1913). History of the Anti-Saloon League. Harvard University: American Issue Publishing Company. ^ Paul Kleppner, The Third Electoral System 1853–1892: Parties, Voters, and Political Cultures. (1979) pp 131-39; Paul Kleppner, Continuity and Change in Electoral Politics, 1893–1928. (1987); Ballard Campbell (1977). "Did Democracy Work? Prohibition in Late Nineteenth-century Iowa: A Test Case". Journal of Interdisciplinary History. 8 (1): 87–116. doi:10.2307/202597. JSTOR 202597. ; and Eileen McDonagh (1992). "Representative Democracy and State Building in the Progressive Era". American Political Science Review. 86 (4): 938–50. doi:10.2307/1964346. JSTOR 1964346. ^ Michael A. Lerner (2007). Dry Manhattan: Prohibition in New York City. Harvard University Press. ^ Prof. Hanson, David (December 4, 2015). "Anti-Saloon League Leadership". Alcohol Problems and Solutions. ^ Shaw, Elton Raymond and Wheeler, Wayne Bidwell. Prohibition: Coming or Going? Berwyn, Illinois: Shaw Publishing Co., 1924. ^ Christine Sismondo (2011). America Walks into a Bar: A Spirited History of Taverns and Saloons, Speakeasies and Grog Shops. Oxford UP. p. 181. ISBN 9780199752935. ^ Michael A. Lerner, Dry Manhattan: Prohibition in New York City, p. 96–97. ^ "US Americanization–American National Identify and Ideologies of Americanization". Science.jrank.org. Retrieved May 26, 2013. ^ a b c Daniel Okrent (2010). Last Call: The Rise and Fall of Prohibition. New York: Scribner. p. 57. ISBN 978-0-7432-7702-0. OCLC 419812305. ^ E.g., "The Economics of War Prohibition", pp. 143-144 in: Survey Associates, Inc., The Survey, Volume 38, April–September 1917. ^ "Connecticut Balks at Prohibition". New York Times. February 5, 1919. Retrieved March 31, 2013. ^ "Rhode Island Defeats Prohibition". New York Times. March 13, 1918. Retrieved March 31, 2013. ^ George, Robert. "Common Interpretation: The Eighteenth Amendment". constitutioncenter.org. Retrieved January 9, 2018. ^ David E. Kyvig (Autumn 1976). "Women Against Prohibition". American Quarterly. 28 (4): 465–82. doi:10.2307/2712541. JSTOR 2712541. ^ Arthur Bousfield & Garry Toffoli (1991). Royal Observations. Toronto: Dundurn Press Ltd. p. 41. ISBN 978-1-55002-076-2. Retrieved March 7, 2010. ^ Jacob M. Appel (Summer 2008). "Physicians Are Not Bootleggers: The Short, Peculiar Life of the Medicinal Alcohol Movement". The Bulletin of the History of Medicine. ^ Jurkiewicz, Carole (2008). Social and Economic Control of Alcohol The 21st Amendment in the 21st Century. Boca Raton: CRC Press. p. 5. ISBN 978-1420054637. 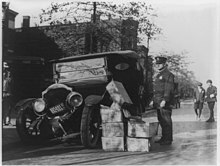 ^ Prohibition, Part II: A Nation of Scofflaws. PBS. , a documentary film series by Ken Burns and Lynn Novick. See video excerpt: Rum Row (video). PBS. ^ Scott N. Howe (April 25, 2010). 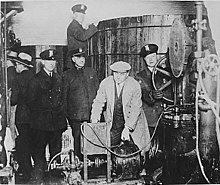 "Probing Prohibition". DrinkBoston. Retrieved February 15, 2012. ^ "United States Coast Guard Office of Law Enforcement". Odmp.org. Retrieved May 26, 2013. ^ Eleven U.S. Coast Guard men were killed between 1925 and 1927. 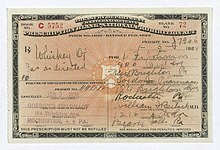 ^ "United States Department of the Treasury - Internal Revenue Service - Prohibition Unit, U.S. Government, Fallen Officers". Odmp.org. Retrieved May 26, 2013. ^ Fifty-six agents were killed between 1920 and 1927. ^ "United States Department of Justice - Bureau of Prohibition, U.S. Government, Fallen Officers". Odmp.org. Retrieved May 26, 2013. ^ Thirty-four agents were killed between 1930 and 1934. ^ Sylvia Engdahl (2009). Amendments XVIII and XXI: Prohibition and Repeal. Greenhaven. ^ David Oshinsky (May 13, 2010). "The Rise and Fall of Prohibition (book review)". The New York Times. ^ Cohen, Lizabeth (1991). Making a New Deal: Industrial Workers in Chicago, 1919-1939. Chicago: Cambridge University Press. p. 255. ISBN 978-0521428385. ^ Davis, Jews And Booze: Becoming American In The Age Of Prohibition, p. 189. ^ Garrett Peck (2011). 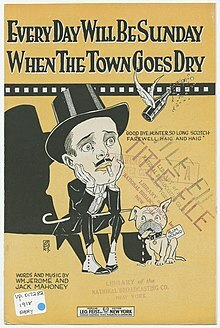 Prohibition in Washington, D.C.: How Dry We Weren't. Charleston, SC: The History Press. pp. 42–45. ISBN 978-1-60949-236-6. ^ Davis, Jews And Booze: Becoming American In The Age Of Prohibition, p. 145. ^ Bauer, Bryce T. Gentlemen Bootleggers. Chicago Review Press Incorporated. p. 73. ^ Bauer, Bryce T. Gentlemen Bootleggers. Chicago Review Press Incorporated. ^ Kyvig, David E. (1979). Repealing National Prohibition. Chicago, IL: The University of Chicago Press. pp. 20–21. ^ Blum, Deborah (2012). The Poisoners Handbook. New York, New York: Penguin Books. pp. Ch. 2. ISBN 978-0143118824. ^ a b Deborah Blum (February 19, 2010). "The Chemist's War: The Little-told Story of how the U.S. Government Poisoned Alcohol During Prohibition with Deadly Consequences". Slate. Retrieved November 7, 2013. ^ a b c d e Rufus S. Lusk (September 1932). 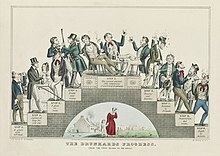 "The Drinking Habit". Annals of the American Academy of Political and Social Science. 163: 46–52. doi:10.1177/000271623216300106. ^ "NASCAR, an Overview - Part 1". Suite101.com. Google. Web. November 22, 2009. ^ Joseph K. Willing (May 1926). "The Profession of Bootlegging". Annals of the American Academy of Political and Social Science. 125: 40–48. doi:10.1177/000271622612500106. ^ Peck, Prohibition in Washington, D.C.: How Dry We Weren't, p. 125–33. ^ Behr, Edward (1996). Prohibition Thirteen Years that Changed America. New York: Arcade Publishing. pp. 240–242. ISBN 9781559703949. ^ "The Lucrative Business of Prescribing Booze During Prohibition"; Gastro Obscura; November 15, 2017. ^ McGirr, Lisa (2016). The War on Alcohol: Prohibition and The Rise of the American State. New York: New York: W.W. Norton & Company. p. 6. ISBN 978-0-393-06695-1. Criminal gangs controlled the large working-class enclave of Cicereo just west of Chicago proper as well; it was soon dubbed "Caponetown." Surrounded by factories, the enclave served as the base for the gangster's operation. 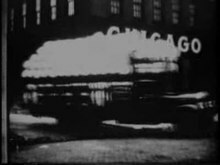 Capone operated uninhibited by police, his illegal empire smoothed by his political connections, violence and wet sentiments of many of Chicago's ethnic political leaders. ^ Pegram, Thomas R. (2008). "Hoodwinked: The Anti-Saloon League and the Ku Klux Klan in 1920s Prohibition Enforcement". Journal of the Gilded Age and Progressive Era. 7 (1): 89–119. doi:10.1017/S1537781400001742. ^ "50,000 barrels ready in St Louis". New York Times. March 23, 1933. ^ Lisa McGirr, The War on Alcohol: Prohibition and the Rise of the American State (2015) pp 231-56. ^ a b Gitlin, Marty. The Prohibition Era. Edina, MN: ABDO Publishing, 2011. ^ Davis, Jews And Booze: Becoming American In The Age Of Prohibition, p. 191. ^ Friedrich, Otto; Gorey, Hays (February 1, 1982). "F.D.R. 's Disputed Legacy". Time. Retrieved May 22, 2010. ^ Poelmans, Eline; Dove, John A.; Taylor, Jason E. (December 11, 2017). 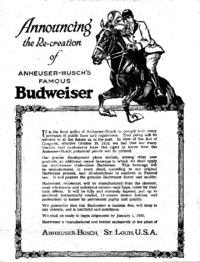 "The politics of beer: analysis of the congressional votes on the beer bill of 1933". Public Choice. 174 (1–2): 81–106. doi:10.1007/s11127-017-0493-1. ISSN 0048-5829. ^ "UTAH'S 1933 CONVENTION SEALED PROHIBITION'S DOOM". June 20, 1995. ^ a b c d Jack S. Blocker, Jr. (February 2006). "Did Prohibition Really Work?". American Journal of Public Health. 96 (2): 233–243. doi:10.2105/AJPH.2005.065409. PMC 1470475. PMID 16380559. ^ U.S. Constitution, Amendment XXI, Section 2. ^ Jeff Burkhart (2010). "The Great Experiment: Prohibition Continues". National Geographic Assignment. Retrieved November 20, 2010. ^ Journal of Studies on Alcohol and Drugs (March 1, 2008). "Survey of American Indian Alcohol Statutes, 1975-2006: Evolving Needs and Future Opportunities for Tribal Health". ^ Great Fortune: The Epic of Rockefeller Center. New York: Viking Press. 2003. pp. 246–7. ^ "The Jazz Age: The American 1920s - Prohibition". Digital History. Archived from the original on September 6, 2006. ^ "Did Alcohol Use Decrease During Alcohol Prohibition?". Schaffer Library of Drug Policy. Retrieved November 7, 2013. ^ "The Epidemiology of Alcoholic Liver Disease". Pubs.niaaa.nih.gov. September 29, 2004. Retrieved May 26, 2013. ^ Garrett Peck (2009). The Prohibition Hangover: Alcohol in America from Demon Rum to Cult Cabernet. New Brunswick, NJ: Rutgers University Press. pp. 22–23. ISBN 978-0-8135-4592-9. ^ Childs, Randolph W. (1947). Making Repeal Work. Philadelphia, Pennsylvania: Pennsylvania Alcoholic Beverage Study, Inc.
^ Hanson, David J. (December 26, 2015). "Repeal in America (U.S.): 1933 - Present". Alcohol Problems & Solutions. ^ Howard Clark Kee (1998). Christianity: A Social and Cultural History (second ed.). Prentice Hall. p. 486. ^ "Professing Faith: Some religious groups supported Prohibition, others did not". ^ Richard J. Jensen (1971). The Winning of the Midwest: Social and Political Conflict, 1888-1896. U. of Chicago Press. p. 67. ISBN 9780226398259. ^ George M. Thomas (1989). Revivalism and Cultural Change: Christianity, Nation Building, and the Market in the Nineteenth-Century United States. Chicago: University of Chicago Press. p. 65. ^ Nancy Koester (2007). Introduction to the History of Christianity in the United States. Minneapolis, MN: Fortress Press. p. 154. ^ Robert Francis Martin (2002). Hero of the Heartland: Billy Sunday and the Transformation of American Society, 1862-1935. Indiana U.P. p. 111. ISBN 9780253109521. ^ Aaron, Paul; Musto, David (1981). "Temperance and Prohibition in America: An Historical Overview". In Moore, Mark H.; Gerstein, Dean R. (eds.). Alcohol and Public Policy: Beyond the Shadow of Prohibition. Washington, DC: National Academy Press. p. 157. ^ Anti-Saloon League of America (1920). Anti-Saloon League of America Yearbook. Westerville, Ohio: American Issue Press. p. 28. ^ Merz, Charles (1969). The Dry Decade. Seattle, Washington: University of Washington Press. p. ix. ^ Coats, A. W. 1987. "Simon Newton Patten" in The New Palgrave: A Dictionary of Economics, edited by John Eatwell, Murray Milgate, and Peter Newman, 3: 818-19. London: Macmillan. ^ Fisher, Irving, et al. 1927. "The Economics of Prohibition". American Economic Review: Supplement 17 (March): 5-10. ^ Thornton, Mark (1991). The Economics of Prohibition. Salt Lake City: University of Utah Press. p. 24. ISBN 978-0874803792. ^ a b Miron, Jeffrey; Zwiebel, Jeffrey (1991). "Alcohol Consumption During Prohibition". American Economic Review. Papers and Proceedings. 81 (2): 242–247. JSTOR 2006862. ^ Dills, A.K. ; Miron, J.A. (2004). "Alcohol prohibition and cirrhosis". American Law and Economics Review. 6 (2): 285–318. doi:10.1093/aler/ahh003. ^ Moore, M.H. ; Gerstein, D.R. (eds.). Alcohol and Public Policy: Beyond the Shadow of Prohibition. Washington, DC: National Academy Press. ^ Edwards, G.; Anderson, Peter; Babor, Thomas F.; Casswell, Sally; Ferrence, Roberta; Giesbrecht, Norman; Godfrey, Christine; Holder, Harold D.; Lemmens, Paul H.M.M. (1994). Alcohol Policy and the Public Good. New York: Oxford University Press. ISBN 978-0192625618. ^ Mann, Robert E.; Smart, Reginald G.; Govoni, Richard. "The Epidemiology of Alcoholic Liver Disease". National Institute on Alcohol Abuse and Alcoholism. ^ Dills, Angela K.; Jacobson, Mireille; Miron, Jeffrey A. (February 2005). "The effect of alcohol prohibition on alcohol consumption: evidence from drunkenness arrests". Economics Letters. 86 (2): 279–284. CiteSeerX 10.1.1.147.7000. doi:10.1016/j.econlet.2004.07.017. These results suggest that Prohibition had a substantial short-term effect but roughly a zero longer- term effect on drunkenness arrests. Perhaps most strikingly, the implied behavior of alcohol consumption is similar to that implied by cirrhosis. Dills and Miron (2004) find that Prohibition reduced cirrhosis by roughly 10–20%...The fact that different proxies tell the same story, however, is at least suggestive of a limited effect of national Prohibition on alcohol consumption. ^ Asbury, Herbert (1968). The Great Illusion: An Informal History of Prohibition. New York: Greenwood Press. ^ Jacks, David S.; Pendakur, Krishna; Shigeoka, Hitoshi (April 2017). "Infant Mortality and the Repeal of Federal Prohibition". NBER Working Paper No. 23372. doi:10.3386/w23372. ^ "Organized Crime - American Mafia". Law Library - American Law and Legal Information. Retrieved November 7, 2013. ^ Charles Hanson Towne (1923). The Rise and Fall of Prohibition: The Human Side of What the Eighteenth Amendment Has Done to the United States. New York: Macmillan. pp. 159–62. ^ Bodenhorn, Howard (December 2016). "Blind Tigers and Red-Tape Cocktails: Liquor Control and Homicide in Late-Nineteenth-Century South Carolina". NBER Working Paper No. 22980. doi:10.3386/w22980. ^ Behr, Edward (2011). Prohibition: Thirteen Years that Changed America. Arcade Publishing. ISBN 9781611450095. ^ E. E. Free (May 1930). "Where America Gets Its Booze: An Interview With Dr. James M. Doran". Popular Science Monthly. 116 (5): 147. Retrieved November 7, 2013. ^ Lewis A. Erenberg (1998). Swingin' the Dream: Big Band Jazz and the Rebirth of American Culture. Chicago: The University of Chicago Press. ^ Bureau of Prohibition, Statistics Concerning Intoxicating Liquors. Washington: Government Printing Office. 1930. p. 2. ^ "PROHIBITION: Wine Bricks". Time. August 17, 1931. Retrieved May 26, 2013. ^ Kelsey Burnham (April 18, 2010). "Prohibition in Wine Country". Napa Valley Register. ^ Hannah Sprecher. ""Let Them Drink and Forget Our Poverty": Orthodox Rabbis React to Prohibition" (PDF). American Jewish Archives. Retrieved September 4, 2013. ^ Karen MacNeil. The Wine Bible. pp. 630–31. Burns, Ken; Novick, Lynn (October 2011). Prohibition. PBS. ISBN 978-1-60883-430-3. OCLC 738476083. Haygood, Atticus G. Close the Saloons: A Plea for Prohibition. 8th ed. Macon, GA: J.W. Burke, 1880. Hopkins, Richard J. "The Prohibition and Crime". The North American Review. Volume: 222. Number: 828. September 1925. 40-44. Jensen, Richard J. (1971). The Winning of the Midwest: Social and Political Conflict, 1888-1896. U of Chicago Press. ISBN 9780226398259. Kyvig, David E. Law, Alcohol, and Order: Perspectives on National Prohibition Greenwood Press, 1985. 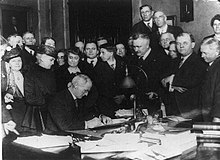 Kyvig, David E. Repealing National Prohibition. Chicago: The University of Chicago Press, 1979. Lender, Mark, ed. Dictionary of American Temperance Biography Greenwood Press, 1984. Lusk, Rufus S. "The Drinking Habit". Annals of the American Academy of Political and Social Science. Volume: 163. Prohibition: A National Experiment. September 1932. 46-52. Miron, Jeffrey A. and Zwiebel, Jeffrey. "Alcohol Consumption During Prohibition". American Economic Review 81, no. 2 (1991): 242-247. Miron, Jeffrey. "Alcohol Prohibition". EH.Net Encyclopedia, edited by Robert Whaples. September 24, 2001. Sellman, James Clyde. "Social Movements and the Symbolism of Public Demonstrations: The 1874 Women's Crusade and German Resistance in Richmond, Indiana" Journal of Social History. Volume: 32. Issue: 3. 1999. pp 557+. Rumbarger, John J. Profits, Power, and Prohibition: Alcohol Reform and the Industrializing of America, 1800–1930, State University of New York Press, 1989. Sinclair, Andrew. Prohibition: The Era of Excess 1962. Willing, Joseph K. "The Profession of Bootlegging". Annals of the American Academy of Political and Social Science. Volume: 125. Modern Crime: Its Prevention and Punishment. May 1926. 40-48. Clark, Norman H. (1976). Deliver Us from Evil: An Interpretation of American Prohibition. New York: W. W. Norton. ISBN 0-393-05584-1. Dunn, John M. Prohibition. Detroit: Lucent Books, 2010. Kobler, John. (1973). Ardent Spirits: The Rise and Fall of Prohibition. New York: G. P. Putnam's Sons. ISBN 0-399-11209-X. Lawson, Ellen NicKenzie (2013). Smugglers, Bootleggers, and Scofflaws: Prohibition and New York City. Albany, NY: State University of New York Press. ISBN 978-1-4384-4816-9. McGirr, Lisa. (2015). The War on Alcohol: Prohibition and the Rise of the American State. New York: W. W. Norton. ISBN 0-393-06695-9. McGirr, Lisa (January 16, 2019). 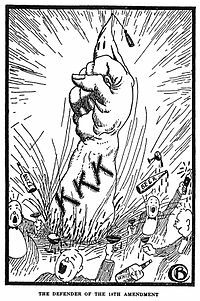 "How the Klan Fueled Prohibition. The 1920s weren't just gin joints and jazz. Anti-immigrant racism was all the rage". New York Times. Meyer, Sabine N. (2015). 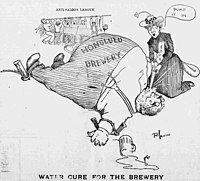 We Are What We Drink: The Temperance Battle in Minnesota. Champaign, IL: University of Illinois Press. ISBN 0-252-03935-1. Murdoch, Catherine Gilbert. (1998). Domesticating Drink: Women, Men, and Alcohol in America, 1870–1940. Baltimore: Johns Hopkins University Press. ISBN 0-8018-5940-9. Pegram, Thomas R. (1998). Battling Demon Rum: The Struggle for a Dry America, 1800–1933. Chicago: Ivan R. Dee. ISBN 1-56663-208-0. 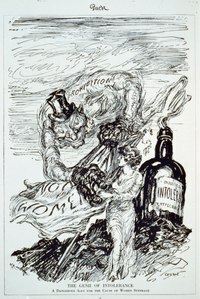 Wikimedia Commons has media related to Alcohol prohibition in the United States.